CELLARIUS - Harmonia macrocosmica seu Atlas universalis et novus, totius universi creati cosmographiam generalem et novam exhibens. CELLARIUS, A. / VALK,G. / SCHENK, P. - Harmonia macrocosmica seu Atlas universalis et novus, totius universi creati cosmographiam generalem et novam exhibens. Harmonia macrocosmica seu Atlas universalis et novus, totius universi creati cosmographiam generalem et novam exhibens. - CELLARIUS, A. / VALK,G. / SCHENK, P.
Title : Harmonia macrocosmica seu Atlas universalis et novus, totius universi creati cosmographiam generalem et novam exhibens..
Map maker : CELLARIUS, A. / VALK,G. / SCHENK, P.. Size : 19.7 x 13.5 inches. / 50.0 x 34.4 cm. Description : Although little is known about the life of Andreas Cellarius (born around 1596), his work Atlas Coelestis, seu Harmonia Macrocosmica is well known among collectors of celestial maps for the sumptuous Baroque style of its 29 double plates. The first 21 constitute a historical survey of cosmological theories, illustrating the motions of the sun and planets according to Ptolemy, Copernicus and Tycho Brahe. The last eight plates are celestial hemispheres and hemispheres depicting the constellations; they are the most ornate of all, and their level of artistic detail has made these plates popular among collectors of fine art. The first of a projected two-volume set (the second volume never materialized), Cellarius’ atlas had its first printing in 1660 and went through two subsequent printings in 1661 and 1666. The Amsterdam publishers Gerard Valk and Petrus Schenk, who purchased the original copper plates plates in 1694 and produced in 1708 a new edition of the Harmonia Macrocosmica, this time without the extensive Latin text that had accompanied the original printings. Despite its continued popularity as an art object, the Harmonia Macrocosmica was panned on its first appearance by professional astronomers (including Cellarius’ countryman and contemporary Christiaan Huygens) for its scientific inaccuracies. 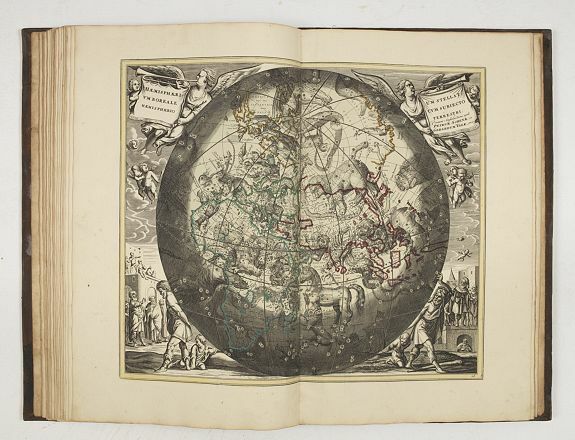 For its peculiarity, the atlas by Andreas Cellarius, published in Amsterdam in 1708 under the title Harmonia macrocosmica seu Atlas universalis et novus, totius universi creati cosmographiam generalem et novam exhibens, deserves particular emphasis, for in it he attempts to depict not only the heavens but the entire structure of the world. The Ptolemaic, Tychonic and Copernican systems are dealt with in 29 plates — the first is particularly detailed, with special concentration upon the theories of the Sun, the Moon, the upper and lower planets; the next two plates represent the Christian, the last six the heathen skies — naturally according to the taste of the period, so that in spite of the neatness of the drawing one can hardly see the stars for the figures. Condition : Folio (530 x 344mm). Title printed in red and black, additional engraved allegorical title by F. H. v. Hoven, and 29 double-page engraved celestial maps, all coloured in contemporary hand. In contemp. full calf binding. Wide margins and dark impressions. Very good throughout.